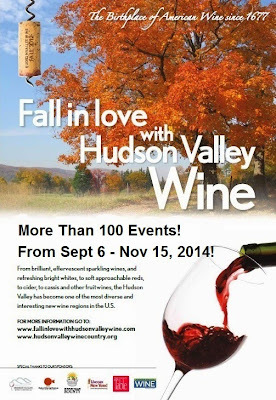 FALL IN LOVE WITH HUDSON VALLEY WINE EVENTS FOR NOV 1 & 2, 2014! CIDER, CIDER, CIDER, AND RESTAURANT WEEK!!!! This is a special week in the Fall In Love With Hudson Valley Wine campaign. Firstly, this is the kick off of The Hard Cider Experience at Applewood Farm the home of Naked Flock Ciders! In some corners of the region, the apple is thought of as the grape of the Hudson Valley. When Applewood Winery first opened in 1994 their first mission was to have some fun and make a superior Hard Apple Cider. The winery has a 40 acre apple orchard and is one of the oldest continuously farms in the Valley. Jonathan Hull and his wife had tasted many commercial hard ciders where the main ingredient was water. Add some concentrate from China or wherever, some high proof fire water and VOILA! They called it Hard Cider and churned it out like widgets off an assembly line. John and Marcia wanted to share a real Cider with the world. The Hudson Valley Hard Cider Experience is a fun way to do it. At the Hard Cider Experience people can enjoy authentic Hard Ciders and Apple wines paired with samples f fine Farm-to-Table cuisine and live entertainment. And of course there's Restaurant Week sponsored by The Valley Table magazine. Enjoy locally grown and locally prepared, farm fresh, farm-to-table dishes in restaurants up-and-down the Hudson Valley, and with them ask for a glass of Hudson Valley wine, sparkling wine, cider, or spirits. Wine Enthusiast Names New York "Wine Region of the Year!" New York is "Wine Region of the Year"
New York State has been named "Wine Region of the Year" by Wine Enthusiast Magazine, with the actual award to be presented at the Wine Star Awards gala dinner on Monday, January 26 in the New York Public Library's Celeste Ballroom. "We are delighted and honored that the New York wine industry is receiving this prestigious recognition, especially given the competition for such a coveted award," said Jim Trezise, President of the New York Wine & Grape Foundation which represents grape growers and wineries statewide. "This award literally belongs to hundreds of people who have worked together on many fronts to improve the quality of our grapes and wines, grow our industry, and market the products. We're the 30-year overnight success." The other nominees for the Wine Region of the Year were Champagne, France; Chianti Classico, Italy; Sonoma Coast, California; and Red Mountain, Washington. In the Winery of the Year category, Long Island's Channing Daughters Winery was nominated, as was Hudson Whiskey of the Hudson Valley in the spirits category. The winners in those categories will be announced later. New York now has more than 375 wineries spread throughout 56 of the state's 62 counties including Brooklyn, Manhattan and Queens. The industry generates annual economic benefits to New York State exceeding $4.8 billion, and the various wine regions have become major tourist destinations, attracting more than 5.3 million tourist visits to predominantly rural regions and more than $400 million in wine-related tourism expenditures. In addition, the quality of New York wines has improved dramatically in recent years, thanks to a combination of world-class research at Cornell University and collaboration among winemakers. A major factor in the industry's dramatic success has been the business climate in the form of a public-private partnership stimulating growth and success. In the early 1980's during a time of economic crisis in the industry, former Governor Mario M. Cuomo initiated a comprehensive package of legislation which transformed it into the fastest growing industry in the important agriculture and tourism sectors of the State economy. That business climate has been enhanced even more by the current Governor, Andrew M. Cuomo. Since he took office in January 2011, Governor Cuomo's "entrepreneurial government" approach has helped propel the industry to an entirely new level. As a result of two "Wine, Beer, Spirits & Cider Summits" that he convened, several important laws and regulations have been changed, and major promotions have increased the awareness and sales of New York wines. In the past four years, 28 new wineries, 100 new farm wineries, and 29 new farm winery branch offices have opened in regions throughout the State. A major reason for that explosive growth is a newly business-friendly State Liquor Authority, which under the leadership of Chairman Dennis Rosen has significantly reduced the amount of time required to obtain a license. Other State government agencies have also provided great support, from the Department of Agriculture & Markets to Empire State Development and the Department of Transportation. In addition, the Genesee Valley Regional Market Authority has provided grants supporting a highly successful "NY Drinks NY" promotion of New York wines in New York City orchestrated by First Press Public Relations. And the New York Wine & Culinary Center serves as a focal point for education about New York wines and other craft beverages as well as foods, agri-tourism and culinary tourism. "Governor Andrew Cuomo has provided the vision and leadership to bring our industry to a whole new level," said Trezise. "But no Governor can act alone, so we are also very grateful to New York State legislators in both chambers from both sides of the aisle who have been enthusiastic partners in this process, in particular Senator Patty Ritchie and Assemblyman Bill Magee who chair the respective Agriculture Committees. On the federal level, Senators Kirsten Gillibrand, Charles Schumer, and former Senator Hillary Rodham Clinton have been terrific champions of our industry and New York agriculture in general, as have several members of Congress from both parties. The industry's success is also the result of many different groups working together with the New York Wine & Grape Foundation, which over the years has had scores of industry professionals serving on its Board of Directors who deserve a lot of credit. Allied groups include the New York State Wine Grape Growers, New York Wine Industry Association, National Grape Cooperative Association, Lake Erie Regional Group, New York Farm Bureau, Long Island Farm Bureau, New York State Restaurant Association, and the many wine trails throughout the state. "'Diversity is our strength, Unity is our power.' That has been our mantra for 30 years, and this award reflects that combination," said Trezise. "This has been a group effort, and this recognition belongs to all the individuals and organizations which have contributed to the advancement of our industry." "This award is also a major step toward fulfillment of our goal--'To have the New York grape and wine industry recognized as a world leader in quality, productivity, and social responsibility." Foliage was just passing peak here at home when I traveled a couple of hours south for TasteCamp 2014, and though I may have been a little bit reticent to leave and miss out on the last of our leaves, the reward for the short drive was an amazing and beautiful passage through a neighboring wine country. It was a vintage autumn show of color this year and if you felt the need to extend your ogling adventure, the Hudson Valley was a ripe portrait of accommodating hues and views. It was also a welcoming place that generously received our motley band of beverage and eats geeks, showing us the inside of a scene, the secret of which, is quickly getting out. The reference material says that the paintings of the Hudson River School are founded on the themes of exploration, discovery and settlement. They portray the relationship of human habitation in the natural world in in a way that strikes a romantic balance between the rugged and the sublime. Overlooked or looked down upon during its early period, the quality of the works have ultimately withstood the scrutiny of connoisseurs over time. It looked pretty much like this all weekend in the Hudson Valley. Thomas Cole would have been delighted. I think that the libations of the Hudson Valley have experienced a similar arc and where at one time they may have been viewed askance or seen as rough around the edges, they are now getting the appreciation their craftsmanship truly deserves. Over the course of less than seventy-two hours, we certainly explored much more ground than we expected, met with many happy discoveries, settled on the fact that this place was for real, and we tasted more than a few things that touched upon the sublime. Tocai Friuliano in the Hudson Valley? è tru fratello...ed è veramente buono. Soft and tropical with a silky delicious factor. Millbrook treated us to a tour, a tasting of their wines and the Seyval Blancs of Clinton Vineyards, as well as a lovely buffet lunch in their fantastic old barn space..
Phylis Feder - Clinton Vineyards and a spectrum of Seyval Blanc - still, sparkling and dessert. She favors a dash of Clinton's raspberry dessert wine in the Sparkling Naturel. A Hudson Kir Imperial? We followed up our first stop with a visit to Ribibero in New Paltz who are the new kids on the block. Tiffany Ribibero and her husband Ryan Selby stepped up to the plate when the winery renting the property owned by Harry Ribibero vacated to a new location. The family dream of running a winery themselves took shape and they recruited well known Hudson Valley wine maker Kristop Brown to join the team, and things have been expanding since. Ribibero Family Winery- Quite the variety for a little winery. The "87 North" white blend is a crowd-pleaser and their biggest seller. The Arctic Riesling was exotic round and tropical with acidity mellowed by barrel time. Cabernet Franc is rocking the Hudson Valley. It may not yet be the “official” red grape of the region, but it seems pretty clear that this particular vitis vinifera likes it there. It buds a bit later than Cabernet Sauvignon, which can be a safety play against spring frost, and it manages to hang well into the autumn giving producers every last heating degree day they can manage to gain before the leaves fall. We tasted quite a range of expressions across the various wineries and one could do an entire Hudson Valley tour just to log the comparatives. Ribibero Cabernet Franc - Dark blue fruits, herbal angles and an air of anise. Glorie Farm - Cabernet Franc - sensitively made wine, fresh and delicate red berry flavors, and a veil of wood spice. Light-medium body weight with soft power. Brotherhood Winery had just celebrated their 175th Anniversary the night before we arrived. They are the longest continuously operating winery in the country and one of New York State’s largest producers. Sparkling Chardonnay that tastes this fun for $10-11...would fuel a lot of holiday parties, if you can find it. Whitecliff crafts delicious wines on ground within view of shawangunk rock faces...northernmost ridge of the Appalachian mountain chain - quartz pebbles and sandstone cemented by silica exposed by the last glaciation. We finished our first day with a stunning view and a hearty, congenial home made chili dinner at Whitecliff Winery, while tasting their Gamay and their equally lovely although more muscular Cabernet Franc. Whitecliff Vineyards Gamay was a crowd favorite and we've already opened the one I brought home. Vigorous fresh splash of reds fruits - cherry, strawberry, raspberry - serious salivary reaction, and a long light follow-through. Screams for crispy fatty roast beast or earthy harvest veggies. I still have a Cabernet Franc in the cellar. Our itinerary offered us a fairly respectable bedtime with enough shut-eye to leave a span for a solid breakfast at the Saugerties Diner. This would be a necessity because we had a big day ahead of us and the first stop would be a doozie. Hillrock Distillery is a self-contained farm-to-glass establishment that is purpose built with the singular notion that whiskey can convey a sense-of-place. Our whole party may have experienced a mass hallucination ( it’s possible…the rye, bourbon and whiskey were that good ), but I’d say we all tasted something extremely unique that day…”the writing of clove and cinnamon” in pure distillate, as expressed by the hills surrounding the malt house. This impressive still at Hillrock is reported to have taken 1000 labor hours to manufacture. I’m going to leave the details of the Hillrock visit to the real aficionados, so I suggest that you read Evan Dawson’s New York Cork Report Article - “Terroir in Whiskey?” and Todd Godbout’s “Discovering Hudson valley Spirits Part 1″. Ashley Hartka - Harvest Spirits - sampling us on some fruit infused vodkas including a super tasty and fleshy peach. As promised there was quite an array of fine distillates for the sampling, but knowing it would be a long day, I visited just a few producers, one of which was the super bright couple at Harvest Spirits who I’d met earlier this year while visiting Carlo. Their handiwork inhabits a nondescript warehouse building within a rambling orchard farm complex in Valatie, NY. A humble steel exterior camouflages the oak capsuled treasures within. Derek Grout & Ashley Hartka make and offer Apple Jack, aged grappas, fruit infused brandies and a gorgeous pear eau-du-vie. Top notch stuff and very reasonably priced with the Cornelius Apple Jack retailing at about $35-40 for a 750ml and the other more esoteric sips like the pear brandy costing less for the 375ml. Be forewarned, the batches are small, so check it while you can and follow up fast if you find something you like. This is impressive artisan distilling in action, and I recommend getting some if you are in the area. Here’s a quick bit of video taken back in the spring. I need more of the pear brandy and must go back. Lunch Break and Hudson Valley Producers tasting at Hudson-Chatham Winery. Dominique DeVito arranged a delicious lunch spread for the group to enjoy while tasting ciders and fruit wines from the Hudson Valley. I was very glad to see Gerry Barnhart from Victory View Vineyards representing for the Upper Hudson Valley, north of Albany. His cold hardy Marquette is a serious full bodied Grenache-like wine that packs more power than many of the traditional vinifera reds grown two to three hours south of him in the NY banana belt . The Victory View Marechal Foch also turned some heads. There were a number of fine ciders to taste that were built for modern markets but the farmstead wild foraged pours from Aaron Burr stood out as links to the drinks of our colonial heritage. Ethereal fruit notes upon earthen and skin bitter backbones remind me a lot of the Fable Farm Fermentory ciders back home in Barnard, VT.
Fruit wines should not be overlooked as lesser beverages. They shine as aperitif, desserts, and as mixilogy components. I was enchanted by the Clinton Embrace and immediately understood Pylis Feder's affection for this raspeberry dessert wine. Who knew so many black currants were grown in the Hudson Valley? I have a liking for Cassis and enjoyed tasting through this spread immensely. My business partner spent an extended period in Burgundy and brought back a number of liqueurs and cremes de cassis that when mixed with marc or grappa were exquisite. Glorie’s Black Currant wine had the classic green herbaceous notes that I know from my own bushes at home. The Hudson-Chatham Paperbirch Cassis was nicely balanced and tilted towards its purple tannins. American Fruits Black Currant Cordial was juicy and tart and I imagined it would do something quite interesting in a Currant Cosmopolitan. Kimberly Peacock pouring purple liquid worthy of royalty. Superior bright expression of the black currant fruit. The Tousey Creme de Cassis knocked my freaking chausettes off. It surpassed any of the imports I’ve enjoyed. The secret? Four different varieties of black currants and honey from Ray Tousey’s own bees. Yet one more example of how my horizons were expanded quite broadly, in the Hudson Valley. While some of our TasteCamp crew availed themselves of the rented bus to visit and ransack a local establishment for their stock of locally produced beverages, the rest of us loitered around the Hudson-Chatham Winery and enjoyed a sampling of the establishment’s soon-to-be-released selections of their famous Baco Noir. 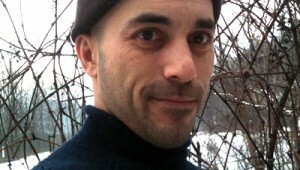 Carlo DeVito and his winemaker Stephen Casscles have something going on with these wines. Red wines that are light in weight, intense in flavor, and eminently friendly with cuisine of all kinds. Yes the amazing “Old Vines” version come from the Finger Lakes, but the local expressions are maybe a bit less concentrated but equally intriguing. It’s an affirmationof the opportunity of the Hudson valley that they can grow both cool climate vinifera and cold hardy hybrids. They may be producing the best of both worlds. Yes! More Hudson Valley Riesling PLEASE! Ben Peacock stunned us with a flight of dry and semi-dry estate grown wines. Broad, energetic and friendly expressions of Riesling that were absolutley unique. Not as slicing as Finger Lakes versions, these forced me to recognize a new bar on the Riesling spectrum. Do the NYC somms know about this yet? TasteCamp is a whirlwind, for sure. It’s not meant to be comprehensive but it is most certainly informative and eye opening. Why more groups don’t meet like this, I’m not sure. I do agree with Richard Auffrey, The Passionate Foodie’s “Rant” because I think the format is a great one. It does take a significant amount of volunteer organizational effort to accomplish some semblance of success, and we attendees understand and appreciate that very much. I’d say that this year, the win for all was resounding, and that many of us will be back in the Hudson Valley, sooner than later, to take another pass at this historical region which is knocking on modernity’s door. One of the stars of the most recent Taste Camp 2014 Hudson Valley was the estate Cabernet Franc from Benmarl Winery. So I was down on the Shawangunk last Sunday and stopped in and saw Matt Spaccarelli. There, on a Sunday afternoon, was Matt, sitting on the back bay of their warehouse dock, munching on a piece of pizza, waiting on 4 tons of Merlot to be pressed. There's never a safe time during harvest season. You're always on call, always at work. As always Matt was incredibly generous an friendly. And he took me on a quick tour tasting his wines in process from the 2014 harvest. A fabulous Sauvingnon Blanc, a wonderful Seyval Blanc, and some incredible reds that were slowly cooking away. Really really impressive. Matt is doing everything extremely right. He is a careful and knowledgeable winemaker. And he is only improving. The most recent evidence was the 90 Point score in Wine Enthusiast for the Estate Cabernet Franc. Big dollops of dark cherry and cassis, with excellent acidity, great balance, and lovely complexity. This is a fantastic wine perfect now or will cellar for at least seven to ten years. A gorgeous wine with huge fruit up front, but a lovely, soft dry finish. The maturation of Spaccarelli from novice to the accomplishments he's just attained. We are seeing the maturation of an artist. His recent scores and his newest wines are a great indication of things to come for Benmarl Winery and for the Hudson Valley.